This is the gauntlet; a place where things are tortured in ways that only an engineer could appreciate. 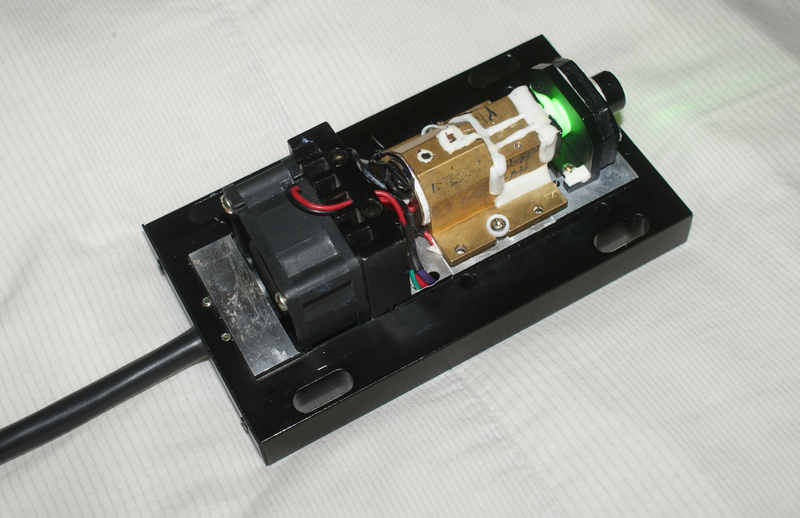 Today’s victim is a 1.0W green laser module, manufactured by Suzhou Daheng under the brand name “DHOM”. As far as Chinese laser manufacturers go, Suzhou Daheng is about one rung lower than CNI in terms of quality. Although US companies like Coherent blow these guys out of the water, both are still reputable nonetheless. As far as Chinese lasers themselves go, this one seems a bit conservatively rated; a nice change from the “1000MW 532nm laser cat toy burning module” that’s not too uncommon on dealextreme and the like. Here are the laser’s typical ratings, as quoted by the manufacturer. Let’s start off by identifying the transverse electromagnetic mode and divergence. The following photo was taken at f/36, 1/2000th shutter and a 4x neutral density filter. For all you camera buffs out there, that should give you an idea how bright this spot actually is. The laser mode hops dramatically as it warms up, but it eventually settles on what I can best describe as TEM11. While theTEM mode isn’t up to spec, that’s not too uncommon in high power lasers like this; getting a TEM00 beam at this intensity is quite hard to do. Fortunately, the mode is circular and will not have a fast axis when focused with a lens. Beam diameter at the output was measured to be 3mm, where it then expanded to 20mm after transversing 20 feet. This works out to be a divergence of about 2.7 milliradians, which is not great, but not terrible either. Certainly a far cry from the stated divergence of 1.5mRad though. Next, let’s test the output power. As expected with a high power DPSS system, it takes a little while for this laser to stabilize. At about 800 seconds into operation though this beam settles around 1.45 watts. That’s pretty good! It far exceeds the manufacturer’s <1000mW rating, even if it must operate at a higher order mode to do so. This is pure green power mind you, since this laser was found to leak no discernible amount of infrared light. Time to put the laser’s modulation capabilities to the test. Supposedly, this one can be analog-modulated up to about 10kHz, but is this true? The following setup will be used to verify this rating. It’s pretty much just a green LED rigged to the input of my scope. At 500Hz, the modulation is nice and square. A wee bit of baseline offset but nothing too concerning. At 5000 Hz we’re starting to see a little bit of slewing. The fall time is still nice and quick though, so no streaking should be observed when using the laser to draw an image. At 10,000Hz the beam’s modulation becomes more of a sawtooth than a square, and falling edge starts to slur quite a bit. I’d say this is about the maximum frequency at which I’d like to modulate this thing at. At 20kHz all hell breaks loose, while at 50k there’s no longer any light to be seen. 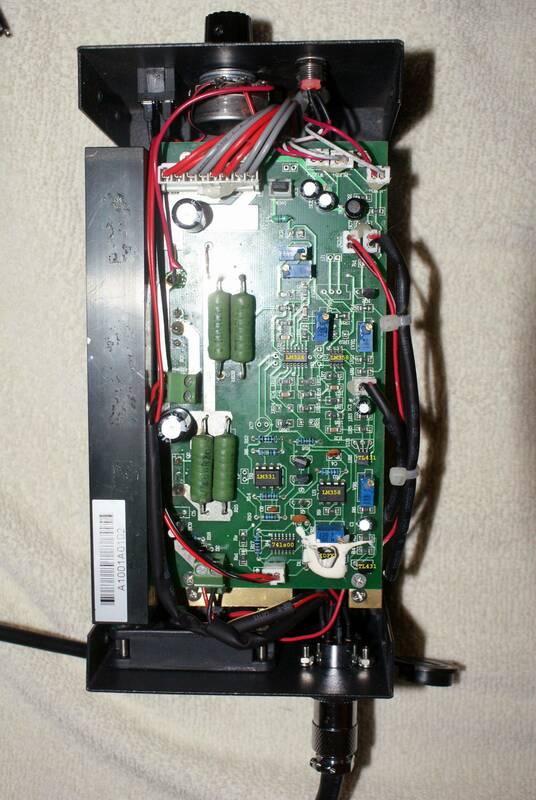 Everybody loves teardown photos, so let’s have a look-see inside the power supply. It seems to be nothing more than a linear current regulator piggy-backed on a switch mode converter. Although the switch-mode PSU looks like a rather high quality one, I’ve measured the 5V bus to be a bit high at 5.13V. Though it’s higher than I would have liked, that 5.13V rail is actually very stable and has no meaningful high-frequency noise. A top-down look reveals a few recognizable ICs. [In case anybody’s wondering, that big potentiometer is actually my modification to the supply. It replaces the inconvenient key-switch that was once there]. While it appears to be built a bit better than the PSU everything in the laser head is cemented with white epoxy; leaving no room for adjustment. Though it’s not atypical for Chinese lasers to be constructed like this, it’s impossible to move those crystals a few microns to coax the laser into TEM00 emission. On the bright side, this epoxy completely protects that KTP and ND:YVO4 from the elements. Overall I’d say it’s an average laser; not wonderful, but not craptastic either. If your goal is to make a laser harp or a projector then this module should work fine, however if your goal is holography or high-speed long-distance communication this isn’t the module for you. At $1200 though, it’s still a good deal as far as the green ones go. That’s all folks; feel free to tweet ideas for future victims to @irfp260. And an ISO rating of? But for $1200, I’ll be sticking with my DX cat burners. For the record I really enjoy thorough write ups and testing (with NUMBERS gents!) on anything and everything. The more information on a subject the easier it is to abuse and muse it into another project. Part of me gets sad if a laser article doesn’t start with a basic safety warning. Just reflection of a laser like this can leave a burned spot on your eyes. 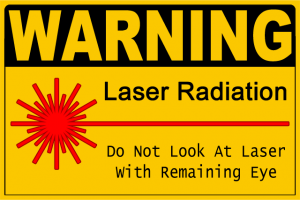 Always use safety-glasses with lasers above 5mW! Agreed, I work with laser every day, safety is very important, it doesn’t take long to lose an eye. a 1.4W laser is way way way over kill, trying to couple the in to a fiber you are just going to produce a tone of other problems ( non linear effects and so on) if you want to do some thing with a laser don’t wast you wast your money on a 1W laser buy a good lower power laser and some nice optics and you will get far far better results. I strongly agree with the parent. I work with lasers on a daily basis as well, and an unfocused 1 Watt laser can easily burn your skin, not to mention irreparably damage your eye. I also note that the author replaces the standard key switch safety interlock with a potentiometer. Irresponsible and dangerous. It’s all a matter of competence, in my opinion. Sure laser light can be dangerous, but it’s not all that hard to prevent a beam from entering your eye. But of course, your secure laser lab never has the kids in playing with your gear – because you’ve never seen them in there, and they promised never to touch ytour stuff. Oh well, hopefully it’s your kids and not the neighbour’s – or your laser-lab will become part of their new house in the settlement. Yep, you only get to look into a laser twice. As a daily laser user i am also shocked that there is no large safety warning on this article. From the photos it looks like these measurements were done with the laser and scope on top of some cushions, this seems like a health and safety catastrophe. I hope the correct laser goggle were being warn. How was the beam diameter measured? I see nothing about knife edge measurements. I can’t tell if you’re saying it should be P=IR or if it was P=IR and now it’s corrected. Watt’s Law – thought I’m not entirely certain how it applies here. Awesome article! This is one of the best technical posts I’ve seen on hackaday for ages. I purchased a Chinese laser, but before I use it, I would like to know how much power it is actually outputting and how much IR. Laser power meters are rather expensive. Aside from using one, what’s another way I might find out these two properties? you failed to identify the product. An unusual format for HAD, but very nice test and writeup. Will be interested to see what else is put through the Gauntlet. One spelling, and possibly factual correction – KTP, as far as I know, isn’t hyGroscopic. My mistake, KDP is the hydroscopic one. Please educate me this: why is laser output power measured at the input (consumption power? That measurement is just the consumption power. Says if the efficiency is 80% the output power would be 1450 * 0.8 = 1160 mW. I doubt the efficiency would be that high. What? I metered the beam itself. I think the issue is the heading right above this section is misleading. If I understand correctly, you actually measured the beam power not the power consumption? The heading, combined with the typical nature of “power” in hackaday articles, can lead the reader to interpret it as Thanh has. Exactly *how* did you measure the beam diameter? Not sure what this review is supposed to be, since there was no hacking involved, it doesnt feature a new or innovative product and the product is – let’s just say “questionable”. I also wonder why Adam wrote about modes. Im not sure what exactly the significance is for anything not communication-fiberoptics. I would assume the typical HAD reader doesnt either. So whats the point besides provoking twohundred posts about warning stickers and radiation protection? oh yeah, the formula for the resonant frequency is wrong. Its supposed to be f = 1 over (2 * pi * sqrt(L*C))! Actually, the mode structure determines (among others) how well you can focus the beam. In particular, the so-called beam propagation factor (M^2) is important – TEM00 lasers would have M^2 = 1.0, but as the fraction of higher modes grows so does M^2. And M^2 tells you directly what the divergence will be after you focus the beam to a certain diameter (beam waist). This matters even for laser pointers (assuming you want to point really far), but especially for cutting and pumping other lasers. Laser power meters are expensive. What’s another good way to check the power on a green laser that you know nothing about? Also, what’s a good way to check for IR leak aside from the webcam method? Calorimeter. Dump the beam into “something”, coffee if necessary, then watch the delta T over time. You’d need 4.186 seconds to heat 1 gram of water 1*C with 1 watt. That method never crossed my mind. What are the usable ranges at which you you use that method? I imagine there is a bottom limit. Measuring a <5mW red laser pointer hardly seems doable. Also, does a red rubber ball heat faster with a red laser vs a blue laser of identical power output? A red rubber ball would just reflect all the red light. It’s an interesting article. I like the format and thanks for knowing what you’re doing and sharing the knowledge. It’s like this post was meant for a completely different site entirely. I’m still trying to decide if that’s something I’m happy about though. why the hate on THIS tare-down? note to non techies: we arent ALL this boring! Blue 1W Arctic for $299 when NOT on sale. I like mine. Box is crap, though. I use dismantled laptop cells (18650) for endless laser goodness. The Arctic also has a code to enter so your kid cant turn it on (most people cant guess under a few minutes anyways; it’s like the displacement game from the 80’s toy “Merlin”), and PROPERLY filtered to reduce rads (rads arent rad, dude). Lasers aren’t my thing, but this article is fascinating! It’s well written, well documented, easy to understand even to my RF-oriented mind. Nicely done… I’d love to see more articles like this in the mix here at HAD!